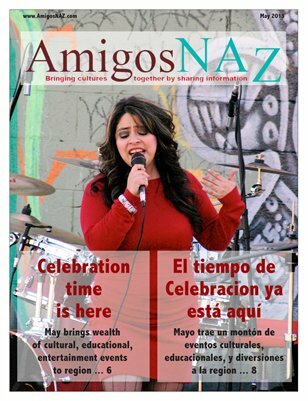 The May 2013 bilingual edition of AmigosNAZ opens with a cover story previewing Cinco de Mayo-related cultural, educational and entertainment events in the region. The edition also includes coverage on the recent Immigration Awareness Week program at Northern Arizona University in Flagstaff, bilingual information on what to do when beginning an exercise program, oral health and Hispanics, women surpassing men in buying technology products, how to live comfortably on a budget, factors that impact the value of a home and a tasty soup for Cinco de Mayo. All this and more brought to you by AmigosNAZ — Providing information for and about the vibrant Latino community in Northern Arizona.